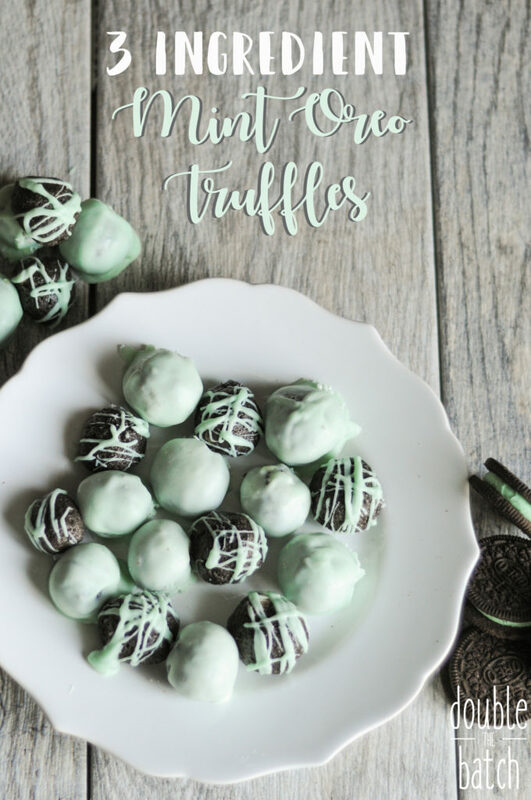 This easy 3 ingredient mint Oreo truffles recipe is a quick go to dessert, especially fun for Saint Patricks day. So delicious and easy you’ll find yourself making them for every holiday! This easy recipe is my go to holiday dessert. I first came across it on Christmas when my sister in-law made them and we all thought they were delicious, especially my husband. I asked for the recipe and was super surprised to find that they only required 3 ingredients, chocolate, Oreos, and cream cheese. It wasn’t long before my husband started asking me to make them and I started trying out different Oreo flavors. 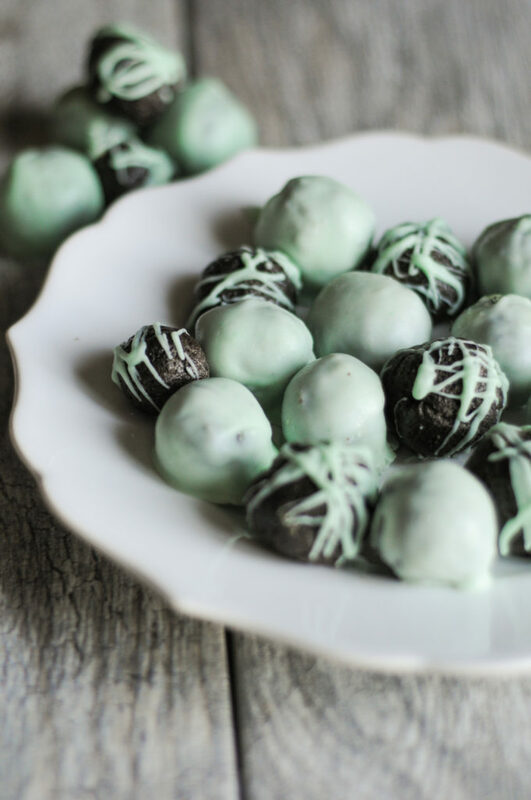 For Saint Patricks day I knew I wanted to make these truffles green, and I am a firm believer that your food should taste like it looks, so green meant mint flavored. It is so easy to get different flavors for these truffles because Oreo comes out with so many different flavors. I noticed on Valentines that they had a special edition chocolate strawberry flavor that would have been fun to make with pink colored white chocolate coating. I’ve also been thinking about doing an ombre of pale pinks and yellows for Easter. The pink being birthday cake and yellow lemon flavored Oreos! Easy, delicious, 3 ingredient dessert that can easily be changed to match any themed holiday. Crush up Oreos to crumbs using a food processor or in a plastic bag with a heavy rolling pin. Add cream cheese to crumbs until well combined either in food processor or with a hand mixer. Melt white chocolate and add a couple drops of green food coloring. 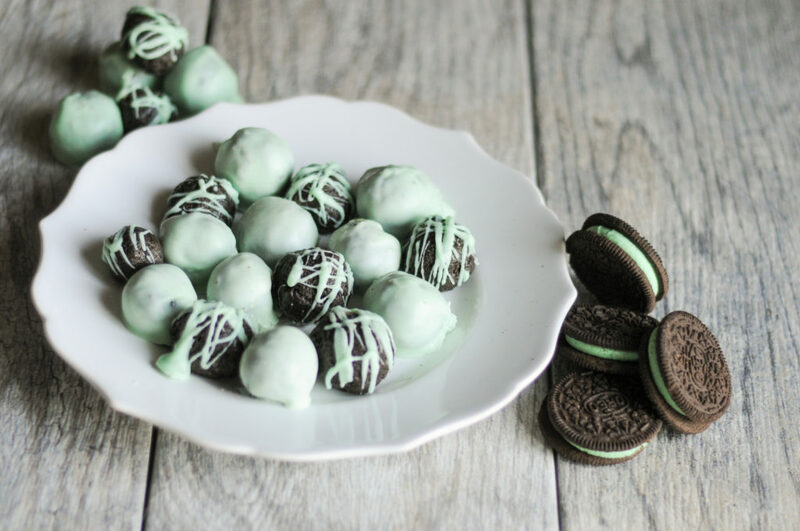 While chocolate melts, roll cream cheese Oreo mix into small bouncy ball sized balls. Place on a nonstick surface, like wax paper. Dip balls into melted chocolate until fully coated and return to nonstick surface to harden. Or drizzle chocolate for an alternate effect. Enjoy once hardened, keep leftovers in fridge. Have any great flavor/color combination ideas? Share below!